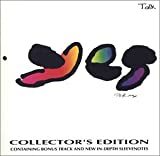 the Yes album that time forgot. released on a label that went out of business shortly after releasing it, this album is difficult to find. and difficult to remember anybody who liked it. it's the last album guitarist Trevor Rabin was on and it was a good way for him to go. I know, I know most people hate the Trevor Rabin era of the band but it's hard to deny he was a good guitar player, and had a good ear for melody and hard rock. I honestly enjoy all three albums he played guitar on for Yes. this album is where Trevor FINALLY got to show what he was truly capable of. unlike steve howe, he IS classically trained, and it shows throughout. the songs are better written than his earlier work, and much more ambitious. hell, he even has his one epic he wrote for the band, endless dream, and it's good. there are ballads, and rockers but they're much more ambitious and non-generic than the stuff he wrote on big generator (a nice album, but not as OOBY DOOBY). the calling is a great way to open the album, and is catchy as hell. the rest of hte songs don't live up to the quality of this song, but they're all good, and none leave a bad taste in my mouth. not a perfect album, but it was a nice way for Trevor to end his time with the band. of course, it sold poorly because Victory didn't promote it at all, then went bankrupt, and in grunge era who cares about Yes? that's right nobody.